What an amazing surprise to receive this invitation. I confirmed seconds latter. Part of me still thought it was a hoax and that when I picked up the badge I would not get one. But to my relief they handed one to me at the pickup both. 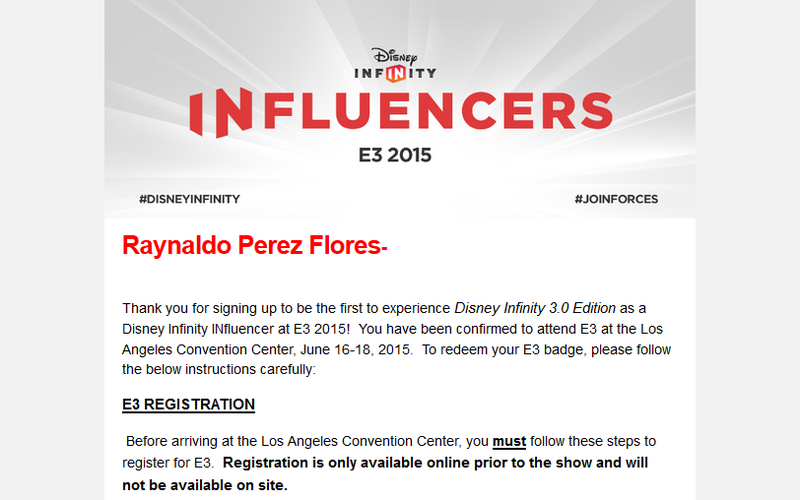 I dived into the sea of gaming people and walked as fast as I could to the Disney Interactive Booth. They gave us a Disney Infinity 3.0 Star Wars Rise Against the Empire Playset. If you had patience you could get into the line for another free figure. I got my hands on Yoda. I ran around the first day getting familiar with all the booths and seeing what the rest of the convention was like. I ran into Allison Petrek early the first day and she had me do an interview. That’s the first time I showed anyone from Disney interactive my custom bases. To my surprise she remembered me from posting custom figures on twitter. The Bungie Booth was near Infinity so I quickly got in line to try the new Taken Kings DLC. They gave us a set of free codes and a Shirt. Lucky for me an employee accidentally pushed me and I dropped my glasses. He felt so bad he gave me extra codes so I sent them out to my Destiny team mates including my brother. The Nintendo area was also spectacular. If you payed the demos you could earn collectible badges. I went from demo to demo and got all of them on the same day. The hardest badge to get was the smash bros one. But after the third try I got it. I had a blast my feet dint though I was so tired by the third day haha.